Carefully managed fires burn up some of the fuel. To help prevent deadly wildfires, some forest researchers* say we need to fight fire with fire. That’s Matthew Hurteau of the University of New Mexico. He says over the past century, aggressive fire suppression has led to forests dense with trees and leaves, which act as fuel. And climate change has made conditions drier and warmer, so when fires do start, they burn hotter, spread faster, and do more damage. Intense fires are also bad for the climate because they kill a lot of trees. When trees die and decompose, they release the carbon stored in their roots and branches. 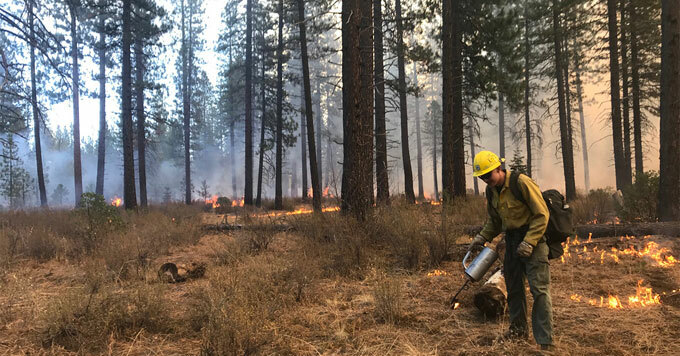 So by using small, controlled fires that thin vegetation, forest managers can reduce the risk of large wildfires – and help protect the climate. *Editor’s note: This sentence was updated 1/25/19 to more accurately reflect Matthew Hurteau’s role.